I have a very strange issue with Infopath. 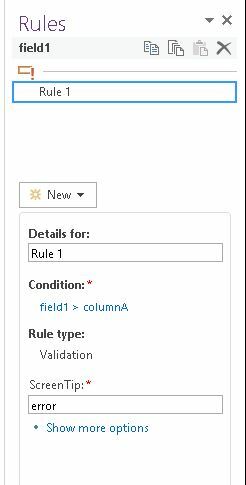 I have create a list in a temp sharepoint sub-site and configured several rules. Everything was working properly. I tried to move this list to a new sharepoint site and tried to configure the same rules. For some strange reason the when I configure a rule for a field to be less or equal of another field works the opposite. For example ColumnA has value 1000$ and on ColumnB the user has to set an amount <= to ColumnA. So I configure rule in ColumnB to be "less or equal" to ColumnA. When I test the list and I enter 999 or 1000 I get the error I was supposed to get if I enter a value greater than 1000. Also the 1000 is not working. Even if I accept this strange issue and set the opposite rule the "equal to" does not work even if I add a 2nd rule for the equal. What’s the column type for ColumnA and ColumnB? Make sure the column type for these two column are the same. Not the answer you're looking for? Browse other questions tagged sharepoint-server infopath or ask your own question. how to set the field as read only in the Infopath 2010 form based on user logged in?